their anniversary card. Hope they like it. Hello Judie. Oh I am sure they will love it. 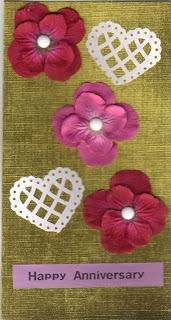 The combination of the hearts and flowers on that lovely textured background, is just beautiful. Beautiful card - they will love it thanks for sharing!!! Hi Judie , that looks like a DL size card and we don't see enough of those .. Is that diecut hearts there? ..they looks so delicate . Love the design . This card is super sweet! I think they are going to love this card! I love those flowers! Beautiful as always Judie, hope you are feeling well. Hi Judie, I just saw a comment over at Shirley-Anne's blog by you. I haven't been here for a while either, You seemed to dissapear for quite a while, hope you are well. Your card is lovely, love the colours of your flowers and that lacy heart too.